The unique characteristic of this wine is that after the grapes have been picked, they are left to raisin for a couple of weeks. Hence, the picking activities are crucial and very delicate, and require special attention. 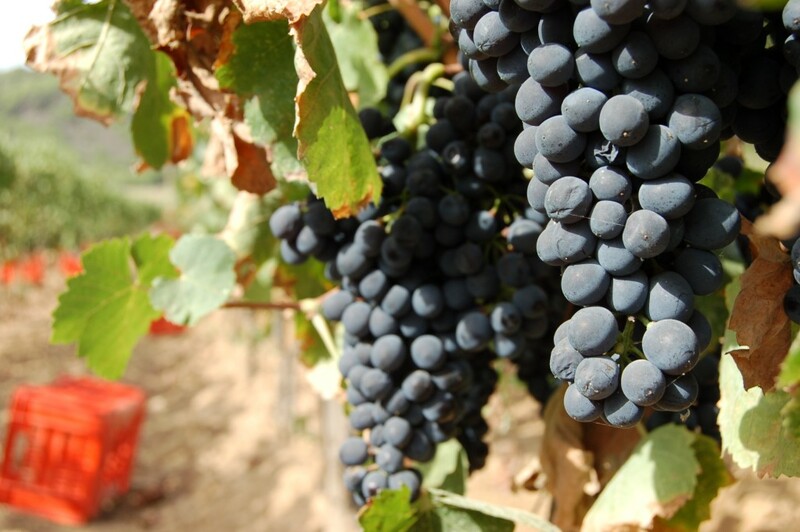 Between late August and early September, the grapes reach full ripeness. With a view to a long raisining process the bunches attacked even minimally by moulds or decay are discarded, and only the healthy and well-ripened ones are gathered. They are gently laid in a single layer onto the same low wide boxes (open on both sides), to avoid crushing, which will serve for the raisining process. Until recent years this process was done on drying racks exposed to the direct sun, with covering during the night to avoid the nocturnal dew; more recently natural raisining in the shade has become diffused in facilities similar to small greenhouses, open only on the sides or ventilated. The selection process continues daily, with the control and any recleaning of the bunches during raisining. Along with the timely elimination of those attacked by insects, moulds or decay this is the only and traditional but effective way of obtaining a high quality raisined grape. (The empty spaces in the photo at the side are left by the discarded bunches). After one week the bunches are turned over to dry them on the bottom side. The greatest difficulty is to identify exactly the moment in which the grapes are ready. This is what makes the difference between the Aleatico of the different producers. The natural period varies according to the weather. In direct sun 7/8 days are sufficient. However, direct raisining in the sun can often be too “violent”. The sugars can caramelise resulting in a brown wine with a cooked taste (not very pleasant!). Furthermore, the speed of raisining in a few days can lead to an easy error in assessing the right raisining moment. 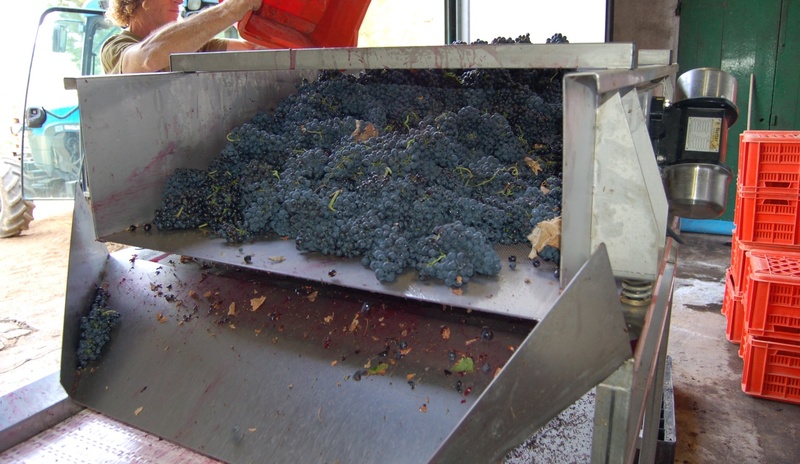 A short raisining process produces dry Aleatico, with a high alcoholic content. A raisining process that is too long results in musts that are too high in sugar content with problems of fermentation: difficult start-ups, stoppages, very long fermentation processes. Spring can be reached with alcoholic contents that vary between 3 or 4 degrees. In the shade 3 or 4 weeks are required. Generally, greater fragrances are achieved and it is possible to better identify the optimal moment of the raisining process. 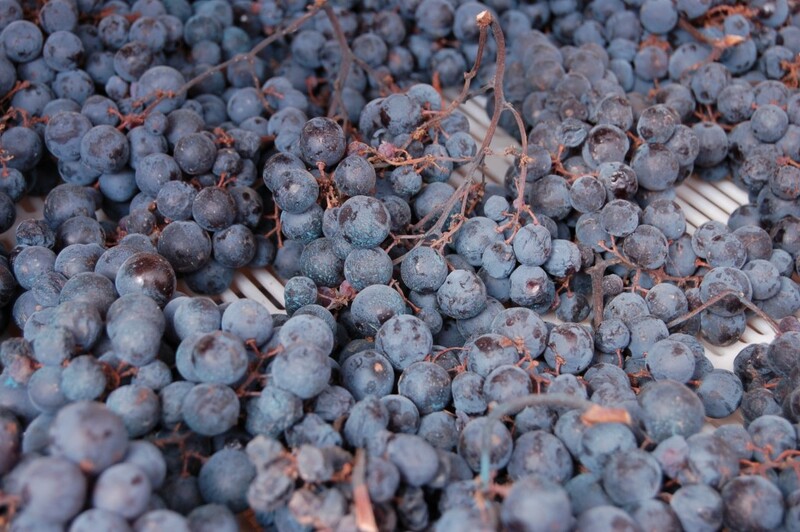 The raisining process can reduce the grapes by up to 60% of their weight. The raisined grapes are destemmed and crushed. Inside the tank, under the exit of the tube of the must destemmer, a cone shape forms. The must is so “solid” that it is often necessary to “flatten” it with a rake in the tank. After a few hours a thick sweet juice can be seen. It is difficult to measure its density with the tools normally used (babo densimeter, refractometer, etc.) because they are all out of scale. It is possible to use a densimeter for concentrated musts with a scale of 1.100/1.300. If the start of the fermentation process appears to be too difficult, it can be made with fresh grapes left on the vines and picked late, a kind of “pied de cuve” with the addition of selected yeasts. Within a day or two the fermentation process will start slowly and constantly. The maceration process will be extended no longer than 5/6 days. With the first racking the skins are separated from the liquid. The liquid obtained by the pressing process is added to the must/wine, avoiding the addition of the last fraction of the pressing process. The fermentation process is concluded during winter (also because the “winter cold” on the island is generally not very cold) spontaneously, when the wine has reached 13°-14° degrees. Some Producers prefer to market the Aleatico in the spring following the harvest. Others, the year after, allowing it to mature in old wooden barrels for two years or more; the duration of the maturation process characterises the organoleptic profile of the wine, resulting in wines with a decidedly more complex flavour, but with the loss of those characteristics of freshness and aromatic quality which have made this wine famous. We belong to the first “school of thought”. The Aleatico I tasted as a child had those aromatic hints which I can find only in the young Aleatico. The bottling stage and the necessary biological stabilisation of this wine only after a few months from the harvest, presents different problems. Sterile filtration is necessary before bottling the wine. Only in this way can we be sure that we will not drink a “Lambrusco” rather than an Aleatico (problem of refermentation in bottles). The high blocking power of the sugars, pectins and colloids contained makes the filtration process difficult and very complex. These problems do not present themselves if one or more years are waited before marketing the wine, as a good part of the “blocking” substances precipitate during the maturation process and do not create those problems to filtration. The Aleatico which is obtained has a more complex aromatic picture, but unfortunately (for me) the distinctive primary varietal characteristics of the Aleatico are lost. – titolo alcol. tot. minimo pari al 19% di cui 12% svolto.